This 2013 Hyundai Tuscon came in with the complaint that the blower did not work. A little bit of testing found that the blower did work on speed number one. 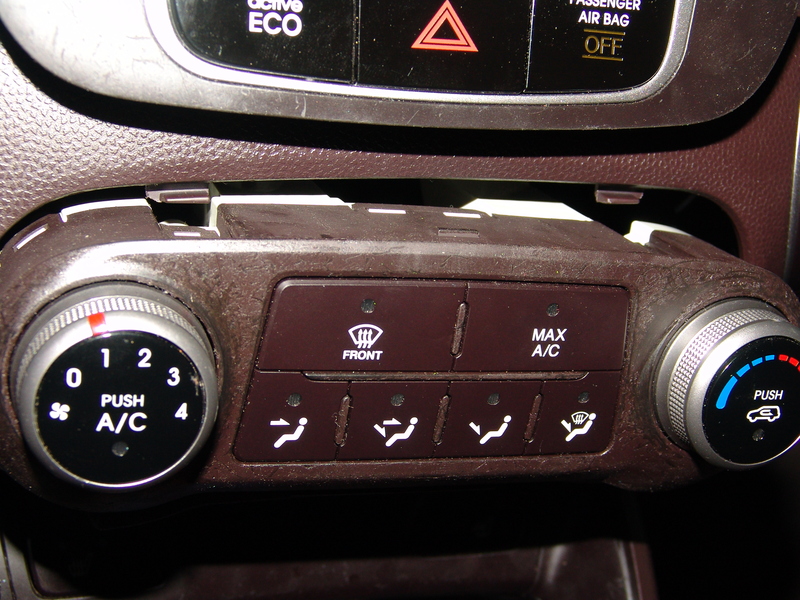 Also the a/c led would light up when the switch was pushed on and the blower speed was set to one. The light would go out when the speed selection was increased. I did do some testing at the blower resistor however I did not take any pictures. No issues were found there. Inspecting the blower switch meant removing a couple of panels to access the screws that hold the HVAC panel in place. I used a plastic pry bar to pull down the lower cover…..
….and the same tool to remove the Hazard switch panel above the HVAC control panel. There were two screws at the top and two screws at the bottom of the control panel. Phillips head. The HVAC panel then had to be popped loose from the dash with a little force. I found this damaged connector at the rear of the blower switch portion of the HVAC panel. The switch also had heat damage. The wires only had a little heat discoloration and it only went back an inch or two on a couple of wires. I called the locale dealership and was told the connector was not available and the switch was only available as part of the whole panel. Since I had to look for a good used harness connector we also opted to find a good used control panel. It took a few days of searching to find a salvage yard that was willing to supply both. I cut and spliced the replacement harness into the original by staggering the splice joints…..
…and sealing the terminals with dual wall heat shrink tubing. I had to play around with the original and the replacement control panel to get the best looking exterior parts. In the end it all worked well and looked good. I was happy and more importantly the customer was.